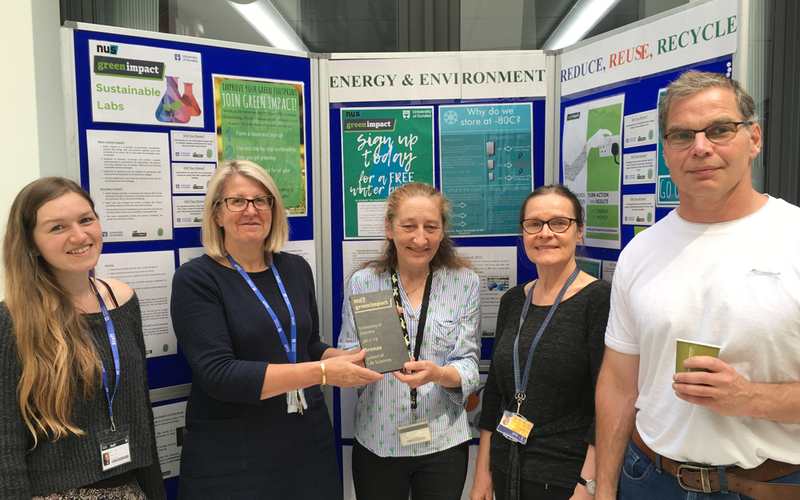 The Green Impact scheme has been established in over 50 universities across the UK which features a tailored workbook of achievable positive actions. To achieve this award the School has reviewed its working practices from buying to disposal. This has included best practice of equipment use, buying low energy equipment, recycling practices and energy usage savings. Simple actions such as changing the temperature of freezers from -80 to -70, regularly defrosting freezers, using timers to ensure equipment is switched on ready for use at the start of the working day but not left on overnight all contribute to energy and financial savings. Input from a number of stakeholders has been required to implement the various ‘green’ actions. With the commitment of the Schools’ divisional lab managers, the School has worked closely with major suppliers, University procurement and Estates & Campus Services to review procedures and work flows. Wherever possible, an ethos of efficient use and minimisation in use of resources has been introduced. The award will be presented in the Street on Tuesday 26 June at 1pm. Light refreshments will be provided. In addition, the University energy and sustainability team will be in the Street from 10 am – 3 pm to provide more information about the scheme and let you know how you can get involved.